Willy Wonka free is the creation of Roald Dahl, a prolific children’s book writer of our times. Such was the popularity of the book that a movie was released in the summer of 1971 named Charlie and the Chocolate Factory. The movie starred some notable actors including Gene Wilder who took on the mantle of Willy Wonka himself. The movie was a stellar success and was loved by both the audience and the critics. A remake of this movie was released back in the year 2005 again, this time with Johnny Depp at the helm as Willy Wonka. The movie, however, didn’t turn out to be too well and was received with mixed reviews. 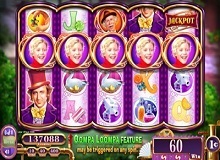 Willy Wonka slot also has been subject to many casino games over the years. The latest in the series happens to be Willy Wonka game made by developers WMS in 2016. The game seems to have been set in a magical land far away from the realms of the earth. There are random appearances by characters of the movie giving gamblers a complete feel about playing the title. The music score is excellence at par with nit bits picked up from the original movie itself. Gamblers would also be mesmerized by the characters which include Willy Wonka, Grandpa Joe, Charlie as well as four other naughty kids including Mike Teeevee, Violet Beauregarde, Veruca Salt and Augustus Gloop. There are also goose with golden eggs, TV cameras, Wonkavator as well as candies in the reels. Scatters: The wonkavator is the scatter symbol in the title. Wilds: The Oompa Loompas are the wild symbol in the game and can substitute for all the other symbols except for scatters and bonuses. Free spins: Players will need to trigger the wonkavator and spin the same. This will then arrive randomly picking up free games, super-sized symbols as well as expanding free spins and a randomly awarded golden ticket and clips from the movie. Gobstopper bonus: In this bonus round, players will need to pick the candy being provided to them on the screen. This candy will either end up exploding or giving you a big reward. You need not worry as both the outcomes will offer you rewards. Chocolate riverside bonus: If you avail this combination, then you will be taken for a ride in the chocolate river. Players get aboard for a ride in the river with an option to collect different goodies. Golden ticket: This is earned when a player earns 1500 or more credits via way of your free spins. In order to get the golden ticket, players will need to pick a Wonka bar from the screen. If you guess it correctly, you will be able to get big wins. 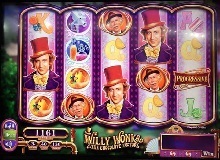 Gamblers can play Willy Wonka slot machine online on their desktops as well as smartphones. Most phones today are compatible with online casino gaming. With the coming of age of HTML5 technology, the growth is further slated for the industry. A good strategy here is to be on the constant lookout for bonuses like the chocolate riverside bonus as well as the gobstopper bonus as these have the potential to pay you big wins. There are no ad hoc rules, cheats or tips for winning the game any other way. 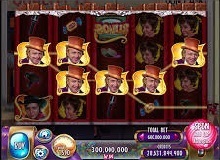 One can play Willy Wonka for real money as well as for free on different casinos online. This is a fantasy production that is immersive in every way and also offers a good avenue for earning big wins. If you are wising to have a good fun filled time playing a slot, then this medium variance slot should definitely be on your list.